The end of February is significant for any number of reasons. However, within the investment world, and particularly within the world of ETF’s, the birth of the Pimco Total Return ETF (BOND) on February 29, 2012, marked what many experts then described as a great test – could a legend from the mutual fund space (William Gross) who managed the Pimco Total Return Mutual Fund (PTTRX) to its present dominance as the world’s largest mutual fund (over $285 billion), match or exceed his exceptional performance within the ETF space? There are countless differences between a mutual fund and an ETF. From the vantage point of fund management, the biggest difference is the regulatory requirement of daily transparency. No longer could Gross (lionized as a master bond trader) buy and sell securities within a veil of “secrecy” – only needing to publically report the composition of his fund four times each year. Instead, within the trade management of BOND, Gross would be required to provide daily disclosure. Many colleagues and financial experts characterized Gross as (alternatively) “incredibly brave”, “incredibly foolish”, or “a risk taker”. I personally consider him all three, since they are not mutually exclusive. He was “brave” because he boldly and famously pronounced U.S. Treasury securities a bad investment as 2011 began – a market stance that cost his huge fund over 400 basis points of return vis a vis the Barclays Aggregate Bond Index during 2011. Therefore, using a sports metaphor, Gross accepted this huge challenge while in a well-publicized “slump”! Gross was “foolish” because he (and colleague Mohammed El-Erian) had been trumpeting for months a thesis that the investment markets had evolved into a “New Normal” that marked the virtual end of robust returns for bonds. Building on the earlier metaphor, Gross’ decision to start the ETF was like a great baseball hitter who voluntarily steps to the plate facing (from the start) a 0-2 count! Finally, Gross was a “risk taker” because he was the very first “big name” active fund manager to move into the ETF space. As we now know, despite these challenges and risks, Gross managed to (figuratively speaking) “hit one out of the park!” Through its first twelve months, BOND was clearly the “Rookie of the Year” within the ETF world. It drew in over $4 billion in assets and it returned approximately 12.5% – a figure about three times what he and El-Erian had been warning could be reasonably expected!! To his credit, Gross very clearly avoided any “closet indexing”. He invested quite independently of the Barclays Aggregate Bond Index. Comparing BOND with that Index, Gross held: 1) half the level of Treasuries; 2) less than one-third the level of investment grade corporate bonds; and 3) a 10% allocation to both foreign bonds and municipal bonds (neither of which are represented in the Index). The results speak for themselves. That 12.5% return bested the Index by 9.5%! And (ironically) Gross even bested “himself” – since PTTRX returned just 7.6% (per Morningstar). Talk about making yourself look bad! But that is precisely the point. Among Gross’ biggest critics are those who complain that BOND is not a “replica” of PTTRX, as its name might otherwise imply. However, anyone familiar with the intricacies of fund management could never have expected BOND to literally “clone” PTTRX! 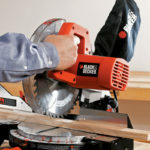 As Morningstar analyst Timothy Trauts opines: “When BOND was launched with about $100 million in assets, Bill Gross was able to start fresh with a brand-new portfolio. The recent outperformance shows how a highly skilled active manager can add tremendous value in a little portfolio. It pays to be small!” It has always been recognized that it is easier to manage $4 billion than to corral $285 billion into a decent return. Illustrating this point, Pimco’s website shows that BOND holds about 800 different positions, whereas PTTRX’s size forces it to hold over 20,000 positions! In this regard, Trauts helpfully likens BOND to a fund of “Bill Gross’ best ideas” because its smaller size permits Gross to be more selective, more nimble, and more quick on entries and exits. Time will tell how BOND fares in its “sophomore year”. 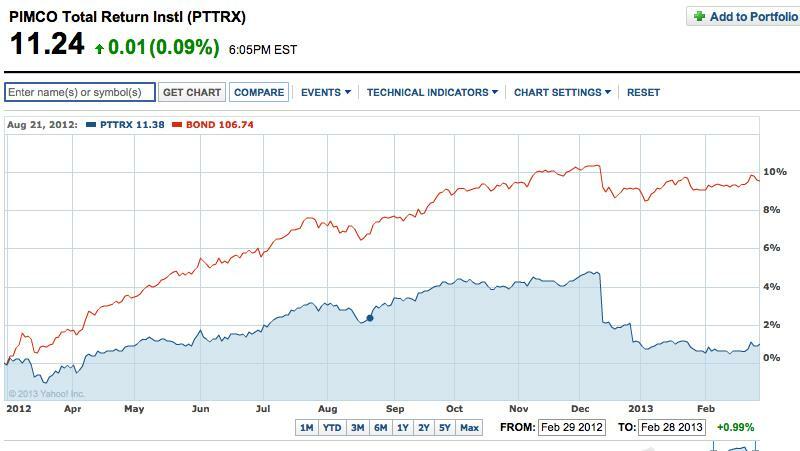 This graph contrasts the most recent 12 months performance of BOND and PTTRX. (Image by Thomas R. Petty, C.F.P., based on data from YahooFinance.com).